WSFS also holds a NASFiC (North American Science Fiction Convention) when the Worldcon is voted to a city outside of North America. With London having won the 2014 site selection, fans now get to choose between Detroit and Phoenix for the location of the NASFiC. 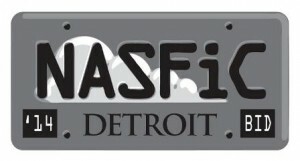 Detroit, Michigan: Tammy Coxen’s bid proposes to hold the NASFiC July 17-20, 2014 at the Detroit Renaissance Center Marriott. The Marriott has 1,200 rooms and 100,000 sq. ft. of function space. The site recently hosted a 10,000 member anime convention, Youmacon. The Detroit bid committee includes Anne Gray, Kim Kofmel, Mark Hall, Lisa Garrison Ragsdale, Jeff Beeler and David Stein, and local conrunners, several who have helped run ConFusion and Penguincon. 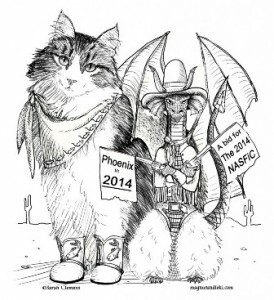 Phoenix, Arizona: Mike Willmoth’s bid wants to hold the con July 31-August 3, 2014 – dates chosen to avoid overlap with Loncon 3 or EuroCon. The proposed facilty is the Tempe Mission Palms Hotel in Tempe, Arizona (which is just outside Phoenix). It has been the site for previous events sponsored by Leprecon,Inc.,including the 2009 North American Discworld Convention, FiestaCon (Westercon 62),the 2006 Nebula Awards Weekend,and World Fantasy 2004. The Bid Committee, Bid Staff, Bid Volunteer, and the current Board of Directors of Leprecon include: Len Berger, Mark Boniece, Warren Buff, Michael Contos, Oz Drummond, Bobbie Dufault, Kathy Duval, Bruce Farr, Jeff George, Jerry Gieseke, Glenn Glazer, Jean Goddin, Chris “Glug” Hensley, Charlene “Charlie” Harmon, Steve Harmon, Patti Hultstrand, Anastasia Hunter, Don Jacques, Jeff Jennings, Louise Kleba, Dina Krause, Bill Laubenheimer, Michael “Moebius” Markman, Pam Matthews, Sean McCoy, Tim Miller, Dawn Mullan, Cathy Mullican, Ron Oakes, Carole Parker, Nora Rankin, Heather Stern, Kathy Sullivan, Gary Swaty, Paul Tanton, Bill Thomasson, Adam Tilghman, Arlen Walker, Lee Whiteside, and Mike Willmoth. 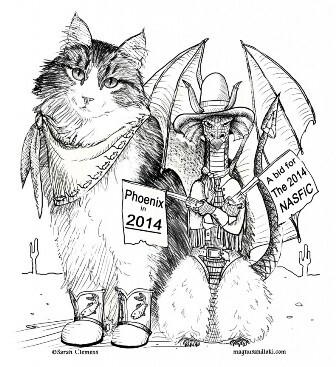 This entry was posted in Conventions and tagged Detroit in 2014, NASFiC, Phoenix in 2014, WSFS by Mike Glyer. Bookmark the permalink.